Often called the family bike happening, Kidical Mass is a venue for parents to teach their kids how to ride safely. If you have ever wanted to ride your bike in a parade with kids of all ages, this is the perfect chance to make it happen. No matter your age, the ride is a blast for everyone! The more the merrier as we introduce the next generation to the joy of bicycles. Children of all ages ride side by side with their families during this monthly event to learn important bicycle safety skills in a fun, festive way. By teaching safe riding skills to children we can create a safer community of riders in the future. As we ride as a group we spread smiles and bicycle love to everyone we pass. Since the program began in 2010, over 900 people have participated in these family-focused events. This year we have two different routes: Themed rides to The Mission and Blues Baseball rides to Sinsheimer Park. All rides begin at Mitchell Park in SLO for a brief safety talk before we start the group ride. Themed rides (May 7, June 4, July 2, August 6) meet at Mitchell Park in SLO for a brief safety talk before we head up the Bike Boulevard (Morro St) then back downtown, ending in Mission Plaza. Blues Baseball rides (May 31, June 21) meet at Mitchell Park in SLO for a brief safety talk before we ride as a group on the Railroad Safety Trail to Sinsheimer Park Baseball Stadium to attend a Blues Baseball game. This ride is perfect for kids who have mastered the traditional Kidical Mass ride and are ready for the additional challenge of riding up and down the Jennifer Street Bridge on a ride almost 2 miles long. Please plan accordingly. On May 31st, thanks to the SLO County Air Pollution Control District and Rideshare, the first 200 adults who arrive by bicycle receive free tickets to the game (Kids get in to Blues Baseball games for free). While these Blues rides don’t have an official theme, we’re looking forward to seeing how everyone gets creative with your costume choices! Special hearty thanks to our two fabulous Kidical Mass sponsors, Rahman Law and Sierra Vista Regional Medical Center. Their generous support helps us teach and inspire future generations of SLO County bicycle riders! 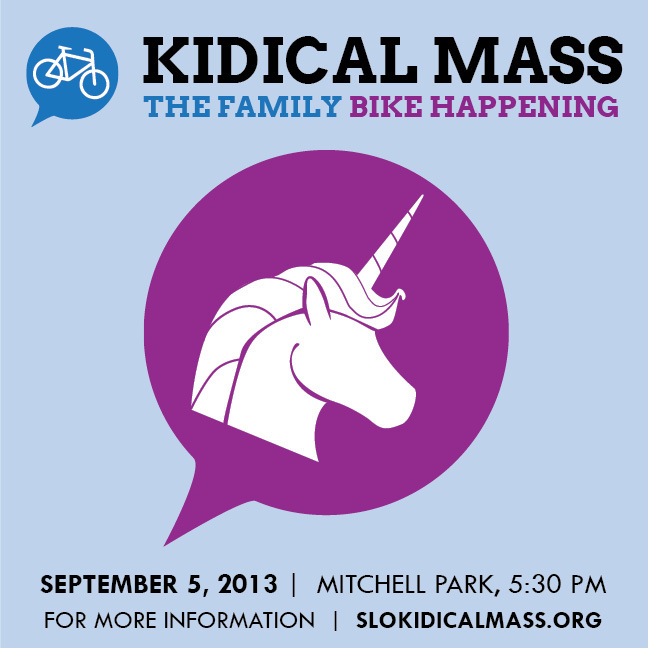 The Last Kidical Mass of 2013 is next week! September’s theme is UNICORNS! Bright white horns, magical sparkles, and mythical animals are welcome as we ride through downtown, to share in the joy of riding bicycles. We hope to see you Thursday for the fun, this is our last ride of the season. View even more information, and invite your family friends on our Facebook event page. ALL participants (kids & adults) must be on a bicycle. We cannot allow parents to walk next to their child on a bicycle, as it is illegal to walk in the roadway. The ride is just about 1 mile, please be sure your child has the ability to keep up with the group so we can ensure the safety of all participants. Practice your bike handling skills at this kid-friendly Bike Rodeo. We’ll be there teaching basic bike smarts, and having a blast riding our bikes together in Morro Bay! This is a great chance for Morro Bay kids & families to get together, ride bikes and show your support for bicycles in SLO County. All SLO County youth can join us by the coast for the FREE bike safety rodeo on the Morro Bay High School track. https://bikeslocounty.org/wp-content/uploads/2013/09/edit_img_7266.jpg 682 1024 Leslie Bloom https://bikeslocounty.org/wp-content/uploads/2015/07/BSC_RGB_340_TEST1.png Leslie Bloom2012-05-03 13:33:442013-12-03 11:25:22Cycle de Mayo this Saturday! Join us for the first Kidical Mass of 2012, just in time for the beginning of Bike Month! We’re excited for our third year of Kidical Mass rides, and hope you*, your friends, and your entire family will join us for the ride! We meet at 6:00 for a brief safety talk before we ride as a group through downtown to the Mission Plaza. If you’re a kid at heart, and want to be a part of the ride, it’s a great chance to volunteer and help get the little riders excited about their bicycles. Sign up to volunteer here, it’s only a 30-minute commitment, and is a blast! *Everyone on the ride should be on a bicycle, including parents and guardians (walking in the street alongside is not permitted). https://bikeslocounty.org/wp-content/uploads/2013/10/KMass_G06.jpg 690 1024 Leslie Bloom https://bikeslocounty.org/wp-content/uploads/2015/07/BSC_RGB_340_TEST1.png Leslie Bloom2012-05-01 18:10:452013-12-03 11:25:22Kidical Mass This Thursday!